This year I'm reintroducing a style series to help you get your wardrobe together and look fabulous no matter what your budget is! Each month we will have a style theme that will force us to re-evaluate our wardrobe and make changes where necessary to improve our style. I say "us" and "our" because I will be participating as well! (I was inspired by this Who What Wear post). As you may have already noticed by the title of this post, January is all about organizing your closet. In this post I have outline how to organize your closet in 8 easy steps. If you find that you need assistance getting your closet in check I am more than happy to help! I have on online style consultation service that will have you ready for next month's style theme. Clean your room! I don’t know about you but I find it hard to work in clutter. Good music! There’s nothing like good music to get you through a project that you may not really want to do but you should. Review all clothing items (tops, bottoms, & coats) and shoes. You are reviewing color (how it looks with your skin tone), style (is it current and flattering to your body type), and wear & tear (your fave pant that is ripping at the seams has to go! Unless of course it can be saved with minor alterations). The goal is to create an “active closet”, meaning only things that you wear should be hanging in it. All sentimental and clothes waiting to be worn until you drop those last 10 lbs should go somewhere else. While reviewing your clothes, use your trash or shopping bags to separate your clothes that need to be altered, stored, or donated/consigned. I recommend taking your clothes that need to be altered and donated or consigned the same day if possible. If not, the very next day. You want to complete your closet editing task and not have bags of clothes lingering around your room for days. 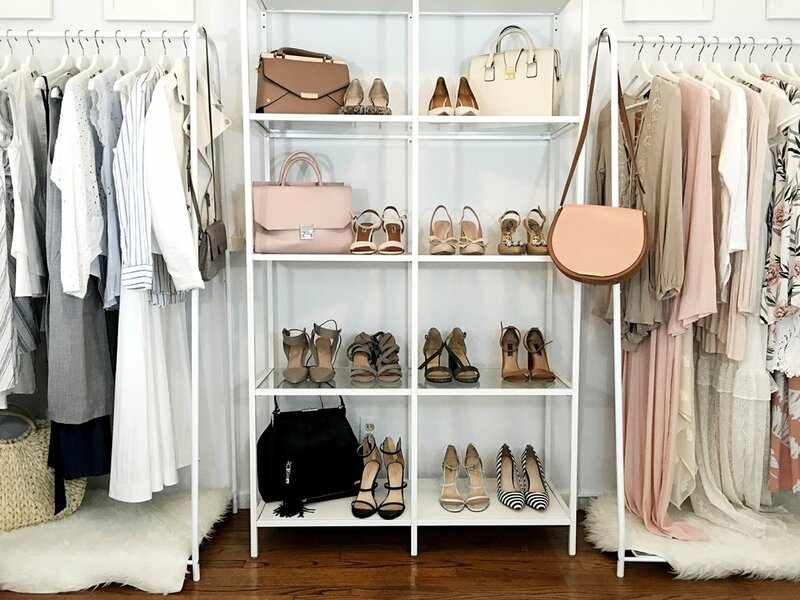 Give your closet more room by storing off season outfits, dressy items that aren’t worn frequently, or sentimental pieces (such as your wedding gown) in another closet or area. You can use vacuum sealed bags to store off season clothing and easily slide the bags under your bed! Now that you have edited your closet like a pro, it’s time to put your clothes back in. Color coordinate from light to dark and group by sleeveless, short sleeve, and long sleeve. This will help make it easy to pull things together. If you don’t have a double rod closet, I would suggest getting a closet rod expander and hang your bottoms on the bottom and your tops on the top. This makes it easier to mix and match. Hang dresses in a space where they flow down without being crunched; jackets should hang in the back or a separate closet. Use matching hangers like, huggable hangers, to give your closet a boutique feel. There are many creative ways to store and hang your scarves, bags and accessories. Adding accessories can really make an outfit but if they’re not visible you’re less likely to use them. There are many different closet organization ideas on Pinterest. I love going through and finding creative ways to display my shoes and jewelry. Check out a few of my faves here! Again, if you need one-on-one, customized assistance email me at style@arteresalynn.com or click on the contact tab at the top of the page and I will be more than happy to lend my personal styling services to you! Be sure to sign up for newsletter so you don't miss any of my style series posts! Next month we will be making over our underwear drawer!